Brownie's announces the first built-in third lung diving system with electric recoil hose reel! We design, build and install custom hookah systems specifically for your vessel. Use it for inspections, maintenance and, of course, recreation. 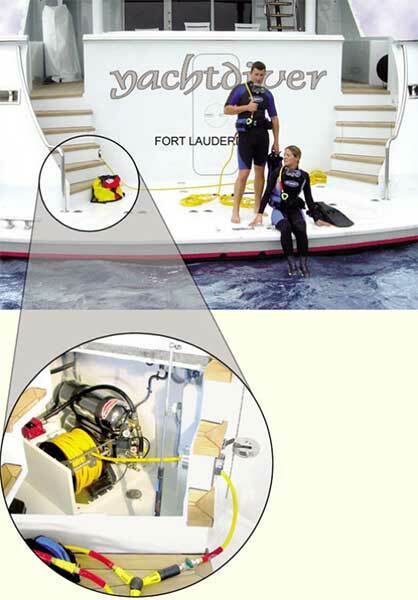 Electric compressor capable of supporting 2 divers to 60 feet, stainless steel accumulator bottle, automatic pressure control switch, powered hose reel - manual payout, electric retract at the touch of the sealed switch, 140' of common down line on reel with QRS™ fittings, QRS™ hose divider, (2) 20' diver hoses with QRS™ fittings, (2) Brownie's adjustable hookah regulators, (2) Drop Weight Cummerbelts™. As more amenities are added to vessels, power systems are more heavily tasked than ever before. The initial start of an electric motor can be especially draining; drawing up to 8 times the full amp load. 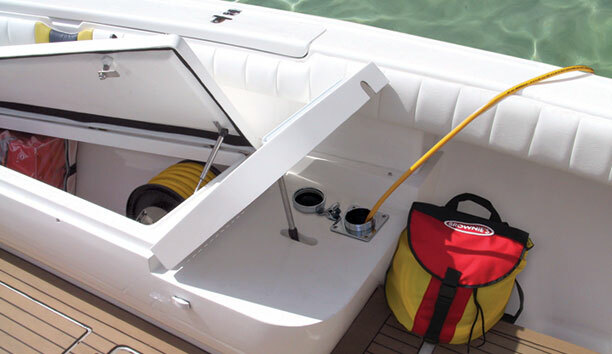 Some boaters must even turn off one or more appliances to turn on a motorized device. As the market leader in the boating compressor industry, Brownie’s understands the unique challenges facing boaters. Our Built-in Hookah compressor series have set the standard for performance, durability and value. Continuing in that tradition, Brownie’s is proud to announce that Built-in Hookah compressors can feature Digital Frequency Drive controllers as an added option. Contact Us for more Brownie's Third Lung E-Reel information.